White gold chains for men are a foundational piece for any guy, whether paired with a pendant or worn on their own. These chains aren�t cheap �bling,��they�re high-quality pieces of fine jewelry that are crafted from a precious metal: 14k white gold. Curb chains are a popular variety of white gold chains for men and Apples of Gold offers these chains in a number of widths, ranging from 2.5mm to 6mm. All of these widths are available in lengths ranging from 18 inches to 24 inches, and several of the narrower chains are also available in a 16-inch option. Each one features a secure, lobster claw clasp. Read more. Curb chains are unique in that they lie flat against your skin. Their style and name is borrowed from the chains used with some types of horse bridles to increase the control that a rider has over his horse, and the twisted links were originally designed not for their looks, but to avoid pinching. However, these styles that drape smoothly across your skin are far more than functional. They make a classic statement of refinement and good taste. 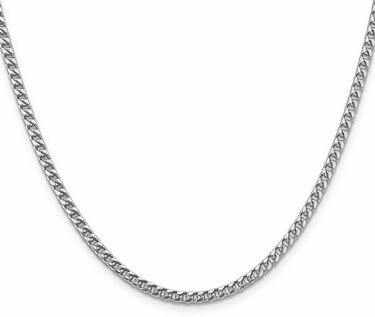 Figaro chains are a classic style that originated in Italy and Apples of Gold�s collection of these white gold chains for men exemplifies this design�s timeless appeal. A pattern of three round links following by one elongated link characterizes these chains, and their name was inspired by the operas of Rossini. Like Apples of Gold�s curb chains, their Figaro chains are secured with a lobster claw clasp. They also come in a range of widths and lengths, allowing you to find the perfect balance of unstated style and a bold statement. Rope chains in 14k white gold are a classic jewelry staple. These white gold chains for men are the perfect partner for any pendant, such as a piece from Apples of Gold�s selection of top-quality men�s crosses. 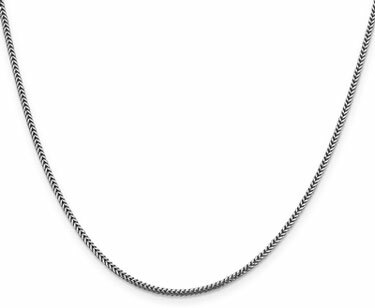 Starting at widths as narrow as 1.5mm and available in up to 5mm, these chains are extremely versatile, taking well to whatever you pair them with. Their twisting style is truly timeless and, since these chains are made to last, they�ll look just as good decades from now as they do today. White gold chains for men offer classic style and versatility that has proven it can stand the test of time. Whether you�re looking for a chain to hold a pendant or one to stand on its own, there�s a chain to fit your taste.